The Net Result fish market at the Tisbury Marketplace in Vineyard Haven celebrated its 30th birthday last week. It’s a popular destination for fresh fish, sushi, and takeout meals under patio umbrellas. Co-owner with his wife Beth, Louis Larsen Jr. grew up fishing on his dad’s boat out of Menemsha and working in his dad’s Menemsha shop, Larsen’s Fish Market, a shop his sisters, Betsy Larsen and Kristine Scheffer, still run. Louie’s brother Dan owns Edgartown Seafood. Louie even ran the Menemsha shop for a few summers in the early 1970s. Louie and his grade school friend Beth Renear, who grew up in Vineyard Haven, married after their college years, and opened the Net Result in 1985 at the business’s present location on Beach Road. After 30 years, they still work side by side, assisted by Jeffrey Maida, who Louie says has been both his left- and right-hand man for 29 of those 30 years. What began as a relatively modest fish shop of about 500 square feet is now closer to 2,000 square feet, and employs 30 people in the summer. The Net Result is a year-round business, except for about a month mid-winter when they give the place a good, thorough cleaning. Louie, who still refers to himself as “just a fishmonger,” has expanded the business to one that sells not only fresh fish and lobster to a large walk-in clientele, but supplies seafood to many Island restaurants, and has a takeout menu that includes lobster, fish and crab cake sandwiches, chowder, salads, appetizers, food plates, hamburgers, and fresh made-to-order sushi. 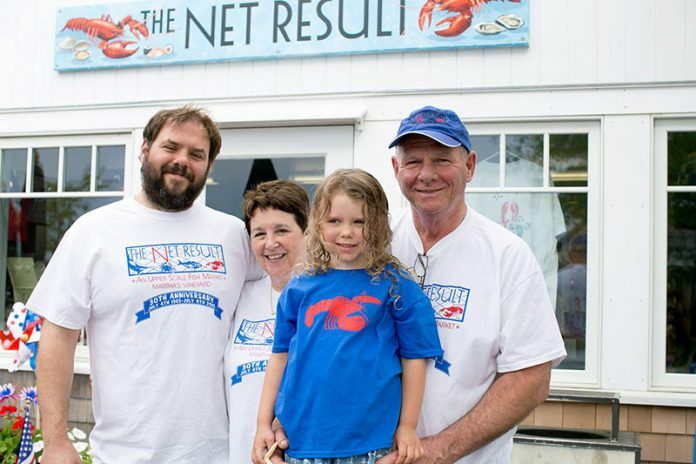 The Net Result email provides daily updates about the daily special, and the weekly winner of the Net Result bumper sticker contest and a two-pound lobster prize. The Net Result provides summer employment for a sizable group of college-aged kids including, over the years, the Larsens’ own three sons. Their son Andrew, 25, now works in the family business full-time. To join the thousand or so who are already on The Net Result email list, or to order online for off-Island orders, go to mvseafood.com, or call 508-693-6071.